Record-breaking ‘Flying Scotsman’ – the most famous steam locomotive in the world – is to visit the Swanage Railway and be reunited with a rare Devon Belle Pullman observation carriage for the first time in almost 50 years. Owned by the National Railway Museum in York, the iconic 97-tonne A3 class locomotive – completed in 1923 by the London and North Eastern Railway (LNER) – will be on the Purbeck heritage railway for 20 days from Friday, 22 March to Wednesday, 10 April, 2019, inclusive. Coupled behind No 60103 ‘Flying Scotsman’ will be a late 1940s Devon Belle Pullman observation carriage – known as Car 14 – that dedicated Swanage Railway volunteers rescued from San Francisco in 2007 where it was being used as a company boardroom. It was between 1969 and 1972 that ‘Flying Scotsman’ ran with the Devon Belle Car 14 in the United States of America during a tour of the country aimed at promoting British exports. Sadly, the company running the tour went bankrupt with ‘Flying Scotsman’ being returned home but the Pullman observation carriage remaining in the USA. Swanage Railway volunteer Mick Gould – Swanage Railway Company business division director and chairman of the No 60103 Steering Group – said: “”The trustees, directors, staff and dedicated volunteers of the Swanage Railway are delighted that the Railway has been successful in its bid to host ‘Flying Scotsman’. “It will be the first time is almost 50 years that No 60103 and the unique Devon Belle Pullman observation carriage – known as Car 14 – will operate together since they ran as a pair across the USA between 1969 and 1972,” explained Mr Gould, a volunteer Swanage Railway train guard and signalman. 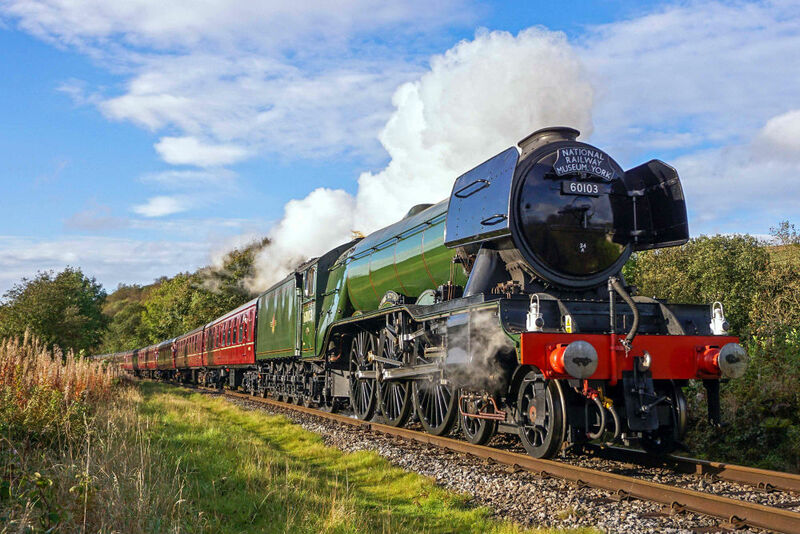 ‘Flying Scotsman’ will be hauling five seven-carriage trains a day from Swanage to Corfe Castle and Norden for five days – from Friday 22 March to Tuesday 26 March, 2019, inclusive – with ticket-only access to stations for the public. Swanage Railway Trust trustee and Swanage Railway Company chairman Trevor Parsons explained: “With uniformed attendants serving champagne and canapés to passengers on board the Devon Belle Pullman observation carriage, Car 14 will be coupled directly behind ‘Flying Scotsman’ when it hauls trains on the Swanage Railway,”That will give Pullman passengers a rare chance to enjoy the delights of travelling in style behind, and watching, the world’s most famous steam locomotive as it travels through the beautiful Purbeck countryside and past the historic ruins of Corfe Castle. Costing £7,944 to build, ‘Flying Scotsman’ was named after the prestigious London to Edinburgh express train service that the locomotive helped to operate – the journey time being eight hours. In 1924, ‘Flying Scotsman’ appeared at the British Empire Exhibition in London and in 1963 British Railways withdrew the locomotive from service.